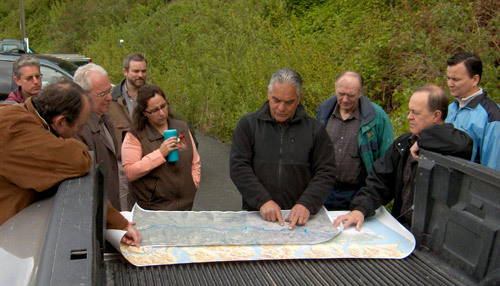 Skwah Chief Jack Mussell offers a briefing on Chilliwack River watershed issues during a field tour. In 2009 a collaboration of individuals from federal, provincial and local government agencies, First Nations and community groups completed a strategy to improve the health and sustainability of the Chilliwack River watershed. The team began work in 2004, and in 2006 the FBC Regional Manager was asked to facilitate meetings for the team. The overarching goal was “to provide a common understanding of watershed values, based on sound science and local knowledge, to assist in decision-making that will promote and improve the sustainability of the Chilliwack River Watershed.” The project aimed to increase public awareness and to identify stewardship and enhancement opportunities. A draft strategy (2008) and series of issues papers examined key challenges in the watershed relating to wildlife and habitat, settlement and growth, resource extraction and human activities. In 2009 the team released a final report and recommendations touching on recreation, forestry, illegal dumping, river hazards, invasive species and fishing practices. Through follow-up with federal and provincial ministries, a number of opportunities emerged for future collaboration. Participants in the initiative include staff of Fisheries and Oceans Canada, Fraser Valley Regional District (FVRD), Fraser Valley Regional Watersheds Coalition (FVRWC), Skwah First Nation, BC Integrated Land Management Bureau, Soowahlie First Nation and BC Ministry of Environment. Funding was from the Fraser Salmon and Watersheds Program, Fisheries and Oceans Canada (Watershed-based Fish Sustainability Planning), the Fraser Valley Regional District, and the Fraser Valley Regional Watersheds Coalition. Work of the team was highlighted in 2009 at a Community-to-Community Forum. Chilliwack River Watershed Strategy Report.